You're invited to join us at Seed Sounds #48, our 4th Anniversary celebration of free improvisation! Our guests this month are both involved with the Peck School of the Arts at UWM, musicologist Tim Sterner Miller, pedal steel guitar; and graduate student Lajos Szabo, electronics. Both bring a wealth of experience across many styles and approaches to music-making. 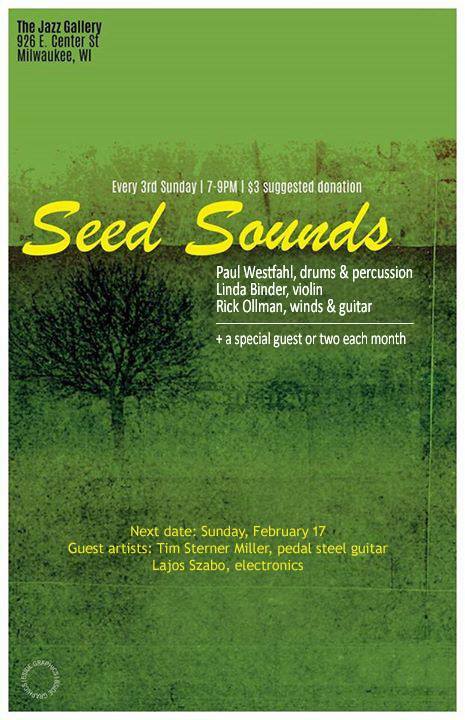 Unfortunately, Seed Sounds drummer Paul Westfahl has another commitment that night, but the other two members of Seed Sounds core group, Linda Binder, violin, mandola, and waterphone; and Rick Ollman, winds, guitar, and percussion will be there. Once a month we test ourselves and test the concept that humans can make music without a score, script, or teleprompter! We start by translating our feelings into sound... which stimulates our fellow musicians into a musical response... which stimulates our own response. It doesn't take long before the stimulus and the response become impossible to separate. Thoughts become ideas; feelings become emotion. When it's not musical (yes, this happens) tension is felt, and a drama occurs resulting in the will to change, resulting in a new stimulus with new responses. Does this remind you of the process of our lives? Surprisingly, shockingly, our lives can be music. And the not-music is the dramatic edge necessary for the music.